Peanut Ball in Labour. A Miracle Tool That Will Shorten Your Labour & Delivery. The Peanut Ball. A Miracle Tool That Will Shorten Your Labour. I’ve just recently learned about a little known secret magical tool used on many labour and delivery units. And I’d like to share! The tool is a funny looking exercise “ball” called The Peanut Ball. It was originally used in physiotherapy, but is now also used for both comfort and functionality in labour. 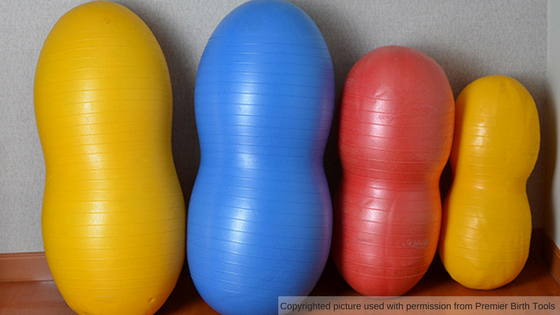 Basically, the Peanut Ball is a type of exercise ball the shape of a peanut, hence the name. With correct use, it can shorten both the first and second stages of labour and reduce the chance of C-section. It looks like two small yoga or exercise balls that are connected with a short tube. I have only recently started to use this tool in my practice, as my previous workplace did not offer the use of a Peanut Ball in labour. To be honest, the first time I saw it I thought it looked kinda funny and really didn’t understand how it could be helpful. Recently, I’ve used it with a handful of women in labour, and I really like what I see so far. If you’re pregnant you’d probably agree, that sleeping on your side is not very comfortable unless you have a pillow or something soft between you legs. This is most likely because your body wants your hips to stay open an aligned. During pregnancy your body makes space for your baby, and once place you’ll need a lot of space is the pelvic outlet. Keeping your legs apart can really help to do this. That’s probably why body pillows are so popular among pregnant women! Once I read up on the research behind the Peanut Balls, I really wasn’t surprised with the outcomes. Let me impart and share the knowledge with you. A few studies have been done that prove that use of a Peanut Ball in labour can shorten the first stage of labour. This is the stage from the beginning of labour until your are fully dilated. One study showed that its use decreased the length this stage of labour by 90 minutes. Another showed a decrease in labour time by 102 minutes! That’s a pretty significant reduction. The reason for this is that by using the different positions with the Peanut Ball, your pelvis is more open. This makes room for your baby’s head and then labour contractions are more efficient in bringing the baby down and eventually out! The Peanut Ball is especially useful when you have an epidural. Once you are lying in bed, gravity will not work as well as it could to bring your baby down into the pelvis. Opening your pelvis up like this is an ideal way to help your baby down, even if you are lying down and have limited use of gravity. That being said, these balls are totally good to use even if you don’t have an epidural! Heck, they can be used in any sort of birthing scenario, at a birthing centre, in hospital or at home. The second stage of labour lasts from when you are fully dilated (10 cm) to when your baby is born. Research has shown that use of the Peanut Ball in labour can reduce the amount of time you need to push. Again, this is most likely because your pelvis is adequately open, which facilitates space for your baby to come down. It’s great to use the ball in a side-lying position in between pushes. That way, you can rest well in between contractions, but also keeps your pelvis adequately open. One study found an average reduction time of 27.6 minutes of the second stage when the Peanut Ball was used. Another study found a reduction time of 22.3 minutes. This is a significant time decrease, as pushing can sometimes take up to 2 hours. This is why L & D nurses, doctors and patients alike love the Peanut Ball! One of the studies on Peanut Ball use found was that for the first year it was used in one hospital, their c-section rates went down about 12%. Now, other factors might have played a role in this, but they claim that the Peanut Ball was the primary change in their patient care. More research is needed with larger sample sizes and higher quality studies to determine whether there is statistical significance in these results, but it’s a pretty impressive first impression! I would love to see a new more vigorous study on this, since that is a HUGE change in c-section rates, something that all hospitals need to aspire to. So, for the Peanut Ball, it’s not a one size fits all sort of thing. There are multiple sizes. You use the biggest ball to sit on. It can be useful to straddle while your partner straddles behind you for support and stability. You can also use it while in bed, for example to lean over in a knees-to-chest type of position. The others are dependant on the woman’s size. The smaller you are, the smaller ball you need. -The 40 cm ball is recommended for women under 5’3. -The 50 cm ball is recommended for women who are 5’3-5’6 and this is the most common size. -The 60 cm ball is recommended for women that are taller than 5’7. Premier Birth Tools is a company that sells these balls and their experts say that one size does NOT fit all when it comes to Peanut Balls, so please make sure you’re using one that fits! There are many different ways to use the Peanut Ball, with most of the positions focusing on opening the pelvic outlet. Side lying is probably the easiest and most common way to use the Peanut Ball, and it’s my go-to position right now. At least as I learn to get more comfortable with the ball. You basically lie on your side, and put the Peanut ball between your legs. You rest your legs in the groove between the two “balls”. A lot of labouring women I’ve used this with says it feels great to have their legs supported in this way. It’s important to rotate the position every 30 minutes to an hour. Changing sides helps the baby to rotate into a feasible position for birth and you won’t get tired lying in one position. I’m relatively new to the Peanut Ball, but I’m really excited to be adding this tool to my toolbox. Anything that can assist new moms in having an easier, faster and more pleasurable experience is worthwhile in my books. The fact that it’s a noninvasive intervention is fabulous! It’s so easy to use but at the same time can do so much to improve labour and delivery. Did you use a Peanut Ball during your labour and delivery? Please contact me and send along your stories and thoughts about this cool new tool. Grant, C. B. & Clutter, L. B. (2014) The Peanut Ball: A Remarkable Labor Support Tool. International Doula, 22(4), 12-15. Wow! That sounds super fast, I’m not surprised it was painful. But better to get it over with. I’m really liking the results I see with this ball! ? You’re welcome!! The peanut balls have become an awesome tool for me, so glad my current workplace introduced them to me. I bought my peanut ball as a ‘just incase’ I needed an epidural. I ended up having a completely natural birth, but I still used the peanut ball. I was 7cm dialated and I’d been laboring in the shower and I was exhausted and just wanted to lay down. I laid on my side with the peanut ball between my legs because I definitely needed that top leg to be elevated. It was kind of relaxing, but also gave me something to squeeze during contractions. I give the peanut ball a big thumbs up. Because my baby wasn’t descending into the birth canal even when I was fully dilated. ? Of course it won’t work for everyone. I had a c-section for the same reasons with my first baby and I’m sure the peanut ball wouldn’t have made a difference. But it’s a good tool to try out if it’s available! Congrats on your new baby!